RAPAPORT... De Beers’ rough-diamond sales slowed in January as a disappointing holiday season piled further pressure on the midstream. Lower-priced stones have been especially weak. De Beers allowed sightholders to defer purchases at its September sale, and subsequently reduced prices of its cheaper goods at the November sight. Sales picked up in December as traders returned from the Diwali break, but the lower-end items remained slow this month. “Rough diamond-sales during the first sales cycle of 2019 were lower than those for the equivalent period last year, reflecting higher-than-normal sales in the previous cycle…and the slow movement of lower-value rough diamonds through the pipeline,” De Beers CEO Bruce Cleaver said Tuesday. The fourth quarter of 2018 saw a mixed season at the consumer level, with major retailers Signet Jewelers and Tiffany & Co. both posting weaker holiday sales than they had expected. 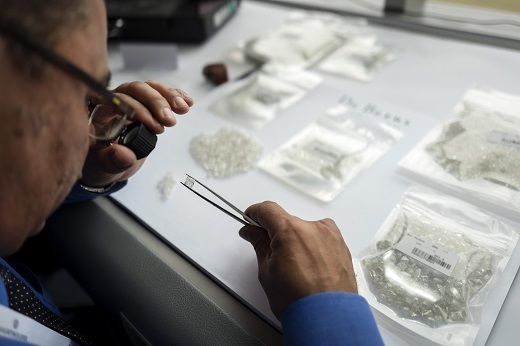 The US-China trade war has created concerns about consumer demand in the two largest markets for diamond jewelry, while the Indian cutting sector is also struggling with tightening bank credit and a weaker rupee. “It seems like there are no solutions to the problems the industry is facing,” Harari added, citing the impact of reduced financing, as well as competition from lab-grown diamonds.